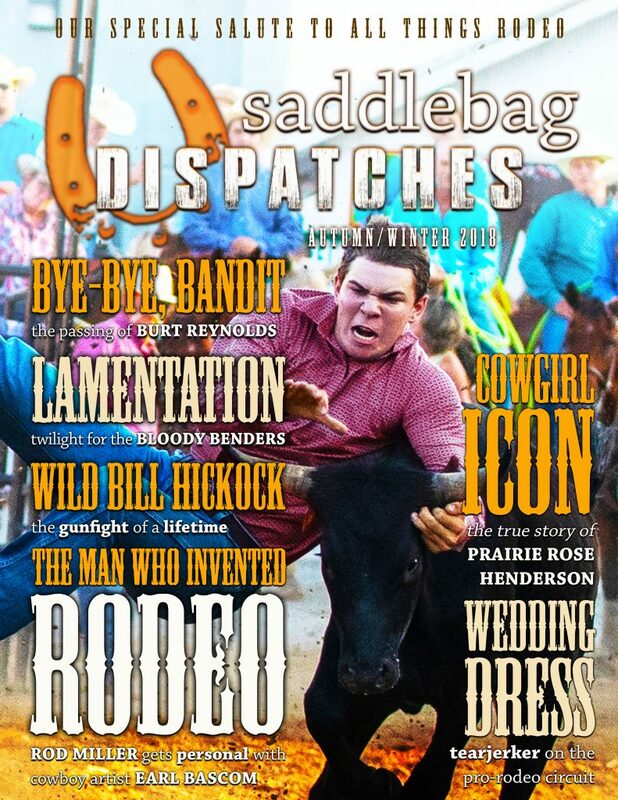 Welcome to Saddlebag Dispatches, Where Stories Of The West Come To Be Told. If you like stories of the West, you’ve come to the right place. But we don’t just tell stories of the Old West. If a tale takes place west of Mississippi and has the spirit of the Old West in it—even if it involves pickups and highways instead of horses and dusty trails—this is where it belongs. In addition to fiction, we publish the best nonfiction about the West as well as poetry, interviews and…well, pretty much anything to do with the West. Are you getting the idea we like things western? Watch for our next Spring/Summer issue, coming in late June, 2019! Welcome to our Autumn/Winter 2018 issue! Click on the cover to get started. Twice a year, we feature interviews with the movers-and-shakers in Western writing, columns by writers steeped in the form, and poetry and fiction from some of the best authors in the business. For our Autumn/Winter 2018 issue, we’re celebrating the great American sporting event known as rodeo. You’ll find fantastic nonfiction and historical pieces from the likes of Spur Award-winning author and poet Rod Miller, Michael Koch, Terry Alexander, John T. Biggs, and Tom Correa; great new short fiction from Dennis Doty, Michael McLean, Kari Holloway, Marlon S. Hayes, and Doug Hocking; the sixth and penultimate chapter of our serial graphic novel event BENDER, written by Michael L. Frizell and illustrated by D.A. Frizell; poetry from John Nebsitt, Michael Lee, Spur Award-winner Rod Miller, and Laurie Duncan; and columns on all things western from our dedicated staff.